I just love participating in the weekly free image challenges at Delightful Inspiration. You get a free image every time you play along and the images are so much fun. It is also lovely to see how the other participants use this image. Nothing like all this great inspiration! Check it out here. The free image this month is "ladybug bloom". beautiful card! please stop by my blog i have an award for you! Such a pretty card! Thanks for playing at Designed 2 Delight! very cute card. thanks for playing with us at CIC. 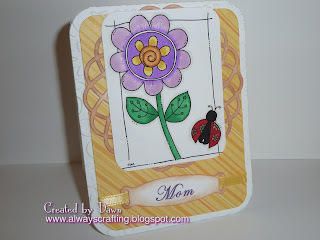 Sweet flowers and ladybugs--this is definately a spring themed card. Cute cute cute. Thanks for joining us at Fairy fun Fridays this week. This is adorable! The perfect image and colors for spring. So pretty! Love that flower! Thanks for playing along at Cupcake Inspirations this week! Lovely card - spechly love the ladybird! Thanks so much for joining us over at Kaboodle Doodles and good luck.